Ugh, if you thought you’d be able to skip my nonsense about monochromatic looks – you’re absolutely wrong. This blue look of madness from Prabal Gurung is everything I look for in a fall outfit 2018. I love the cold color scale, yet the contrasting shades of blue. The layering of the turtleneck, sweater and the asymmetrical skirt creates a cozy and casual vibe. As the silhouette is rather neat, it works to add the boots as it doesn’t make the outfit look too heavy. Also, note how the different textures of the outfit melts together – ahhh, lovely! I don’t know if the look itself is that good, but the vibe it creates certainly is! I love the office style this look embodies and I think it shows how well houndstooth works for fall in the office context. The choice of going for a wide pair of pants adds a nice level of drama to the outfit and the pointy shoes are as fierce as they can get. I don’t know what the scarf (?) is doing, but let’s leave it alone for the sake of it! Instead, focus of how well the defined shirt, with the hint of the collar, frames the outfit nicely. This outfit kind of has a 80s vibe to it though, doesn’t it? Love the contemporary style of it, regardless. Oh McQueen, what are you doing to my fashion heart? If you’re truly a nerdy fan of TFF you know that I have a soft spot for delicate dresses paired with statement boots. It’s just such a striking balance of soft and edgy, subtle and bold. This look from Alexander McQueen is without a doubt one of the best looks I’ve seen from the Pre-Fall 2018 cataloge. It’s something with the gorgeous pattern of the midi dress, the cut-outs and the fall of the fabric. This with an edgy and contemporary pair of shoes gives that “chic without trying”-effect. It feels like an homage to the modern fashion history….or something. I want to live in this creation! Oh yes love all three of these inspos. Prabal always has these timeless – chic combinations that I truly adore. And the off-white suit is also amazing! These are some great looks! Love it! I love P.G and A.M! They are both talented designers. These two outfits are gorgeous. These outfits are making me so excited for fall!! That white dress is stunning! Certainly love all three, but if forced to choose I would go for the fabulous lace by Prabal! I am soooo ready for fall! 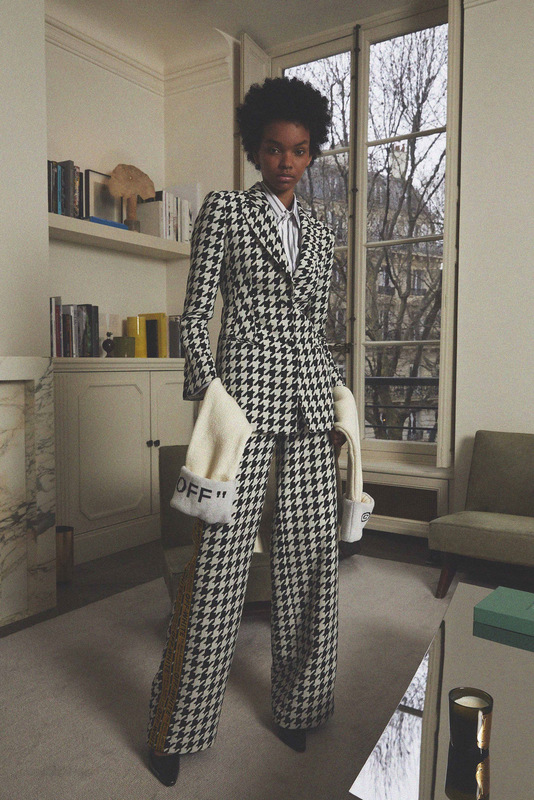 In love with that houndstooth suit! I love off white, actually. This midi dress is absolutely gorgeous. Oh that monochrome blue look is amazing! I know I want that!? love the suit too! But let’s enjoy summer a bit longer!